“This world is but a cherry fair”, wrote Chaucer, and as I pucker up with a bowl of sour ruby-red cherries at my fingertips, I confer. Thin skinned and intensely flavored, sour cherries are slightly smaller than sweet cherries and boast a truly incomparable juicy-tart flavor. Their season is brief—a few short weeks at the end of June and beginning of July—and the fruit itself is highly perishable. Last weekend I picked up a large basket of sour cherries at my local farmers market and decided to make a classic, sour cherry pie. 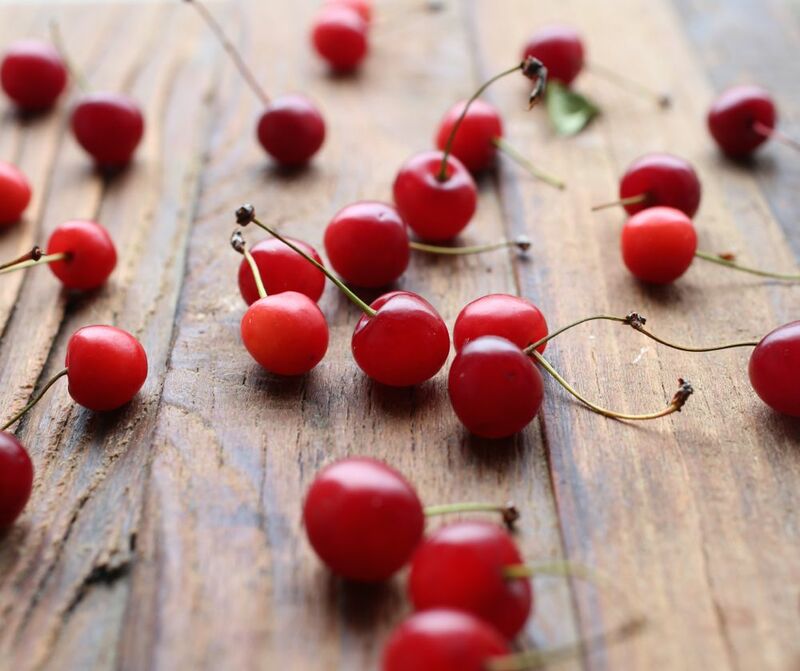 Sour cherries have a satisfying tartness and depth of flavor that their sweet counterparts can’t imitate. Tart and sweet, this familiar dessert—crowned with an old-fashioned lattice top—evokes an era when lazy summer afternoons included pie, ice cream, and a tall refreshing glass of fresh lemonade. Fortunately, these little jewels are not just limited to pies, they also make excellent preserves, scones, cakes, gelato, and more. While they are in season, I’ll be baking and cooking with as many sour cherries as I can. I made a small, 5.5-inch, pie and halved the following recipe. If you would like the halved recipe dimensions, see at the end of this post and adjust the cooking time. 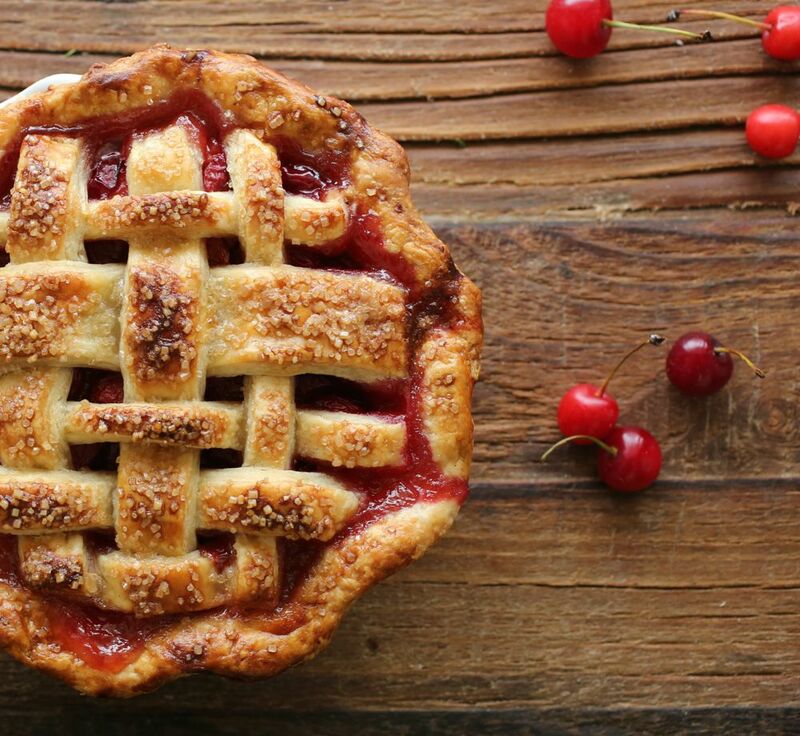 A smaller pie might take less time to cook. Have ready and refrigerated one pastry-lined 9-inch pan and pastry round or lattice top. Combine the cherries, lemon juice, sugars, arrowroot, allspice, salt, half egg and bitters in a large bowl and toss well to combine. Pour the filling into the refrigerated pie shell, arrange the lattice or pastry round on top, and crimp edges of dough. Chill the pie in the refrigerator for 10-15 minutes to set the pastry. Meanwhile position the oven racks in the bottom and center positions, place a rimmed baking sheet on the bottom rack, and preheat the oven to 425F. 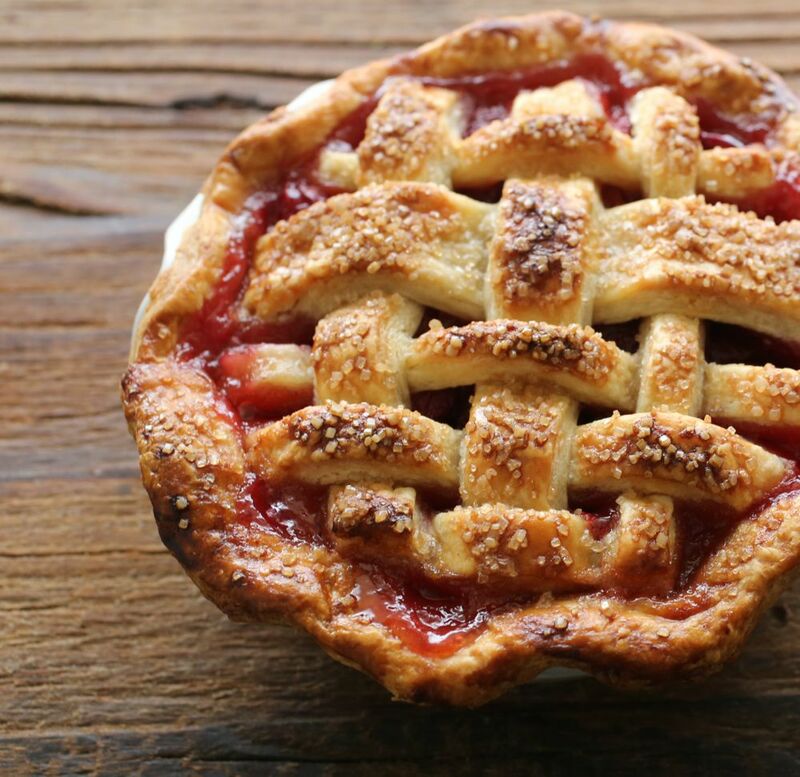 Brush the pastry with egg wash, if using; if your pie has a lattice top, be careful not to drag the filling onto the pastry (it will burn). Sprinkle with turbinado sugar, if using. Place the pie on the rimmed baking sheet on the lowest rack of the oven. Bake for 20 to 25 minutes, or until the pastry is set and beginning to brown. 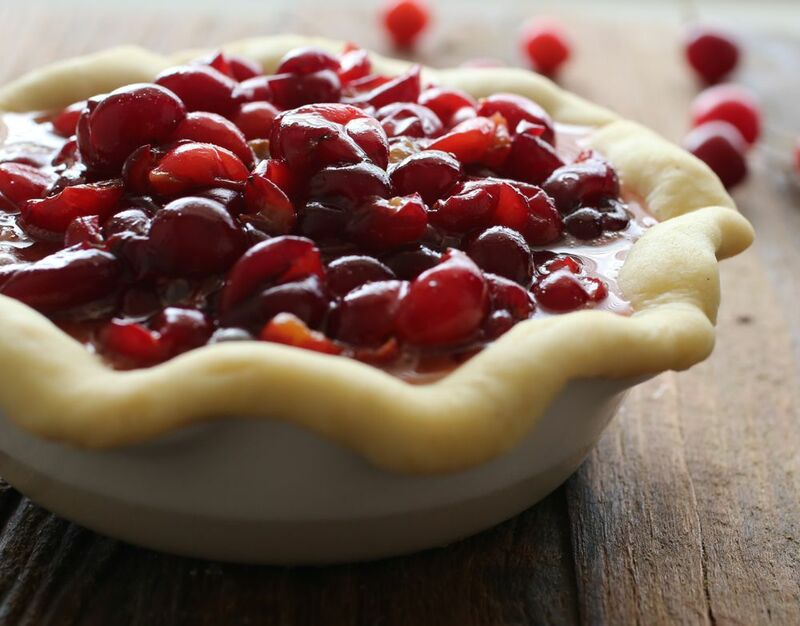 Lower the oven temperature to 375F, move pie to the center oven rack, and continue to bake until the pastry is a deep golden brown and the juices are bubbling throughout, 30 to 35 minutes longer. Combine the water, cider vinegar, and ice in a large measuring cup or bowl. Sprinkle 2 tablespoons of the ice water mixture over the flour mixture, and mix and cut it in with a bench scraper or spatula unil it is is full incorporated. Add more of the ice water mixture, 1 to 2 tablespoons at a time, using the bench scraper or your hands (or both) to mix until the dough comes together in a ball with some dry bits remaining. Squeeze and pinch with your fingertips to bring all the dough together, sprinkling dry bits with more small drops of the ice water mixture, if necessary, to combine. Shape the dough into a flat disc, wrap in plastic, and refrigerate for at least 1 hour, preferably overnight, to give the crust time to mellow. Divide the dough in half before shaping each portion into flat discs.